Meet the Owners of Kalahari Skies! Eddy has always loved nature. 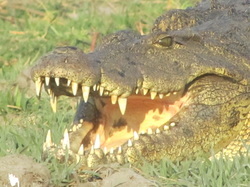 After seventeen years as a guide in his native Belgium he became captivated by Botswana and moved there permanently. He has been a professional licenced guide since 1997. He and his wife Mano have worked in all areas of the safari business and together they now have become the sole owners of the company. Eddy speaks French, German, Dutch, English and Afrikaans. He is a talented ornithologist and a highly skilled walking safari guide. Mano is Eddy’s wife and has been in the tourism business for many years, she is a fantastic cook and she organizes the menus and meals for all our safaris, she is essentially an indispensable part of the company. While a little quiet and a bit shy, she is always in a good mood and ready to make your safari experience unforgettable. Of course the owners are just that, without a competent staff there can be no company and we have been incredibly fortunate to have been able to put together a great group of people that make Kalahari Skies the company it is. Ndintini is our ever reliant office assistant that does everything that needs being done in the office – from fielding phone calls, to photocopying, and binding and laminating brochures. She always manages to do it all with her pleasant smile. Newman is our Senior Guide, with the eyes of an eagle, an innate sense of the bush that can only be acquired by having grown up in it and a smile that you can see for miles. He is incredibly knowledgeable and just a good all rounder in the bush – knows his wildlife, his people and is a pretty good bush mechanic to boot. If you do a safari with Newman, we guarantee that you will come back with a smile as big as his. Steve is our cook and camp manager extra-ordinare – able to set up a full camp single handedly (although he doesn’t have to) and whip up a gourmet meal on a camp fire with the most basic of facilities. Not only that, he will then serve dinner and present you with a fantastic wine to go with the meal. Ezechiel or “Easy” is exactly like his nick name: easy going but at the same time an unbelievable work horse and cook. He has more than 15 years experience in all kinds of camp duties and still does all of them smiling. He is the ghost of the camp that does it all without being noticed ! Rainy is our all around general handyman, assistant and assistant guide. He runs around getting the materials ready for the next safari - making sure that the vehicles have all the equipment on board, firewood, water, fuel, tyre pressures and that all the other thousands of things that need to be done, are in fact in order. And again, all done with the most pleasant of demeanor's and a huge smile. Sidney, joined Kalahari Skies early in 2016, he has proven himself an outstanding member of the team in a very short time. He is always cheerful, friendly and has a very welcoming smile for every person he meets. Every client that has been on safari with him so far has had only good things to say about Sidney. Meet OT, he is very quiet and unassuming, but very helpful and friendly, he has a very high standard that he hold himself to in his work ethic and this shows in everything that he does, he is a welcome addition to the Kalahari Skies team and we are very proud to have him! Tumelo is the newest addition to the Kalahari Skies team, he is an excellent cook and outstanding camp assistant. He has a great personality under a very shy exterior, he recently passed his drivers tests and is exceptionally proud of this achievement. They inspect each vehicle after a safari checking for any problems, making sure the oils, water, brakes and that all the mechanical aspects of our vehicles are 100 percent and ready to go for the next safari.